Announced on Tuesday, Medisafe's Health Records support will allow iPhone owners to automatically import and manage prescriptions from participating health systems in the iOS Health app. Apple threw a spotlight on Medisafe when it revealed the Health Records API in June. At the time, Apple touted the app and platform's potentially life-saving medication tracking capabilities. 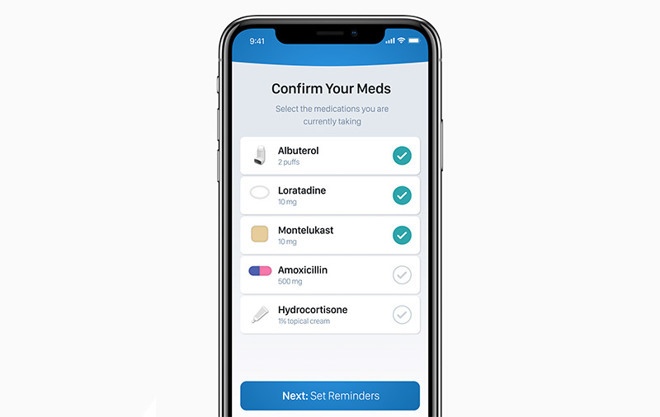 "Medisafe will be able to warn patients of problematic drug-drug interactions because they have the comprehensive view of the patient's exact medication list from several hospitals and clinics," Apple said in a press release. Medisafe expanded on the system in its own statement on Tuesday, saying Health Records' framework facilitates immediate cross-referencing of prescriptions uploaded by physicians. Notifications occur when a user is prescribed two or more medications, vitamins or supplements that negatively interact with each other, the company says. According to Medisafe, the app has alerted users to more than 93,171 DDIs, about half of which were severe or life-threatening. That figure will likely rise with support for Apple's health platform. "As the only Health Records app featured in Apple's launch to developers last June, Medisafe has used the Health Records API to bring consumers a private, easy-to-use solution that both helps them stay on track with their meds and safeguards them against harmful drug interactions," said Medisafe co-founder and CEO Omri Shor.